If your church existed during one or both of the world wars, there is probably a memorial on the wall—sometimes a bronze plaque erected after the war commemorating those who died; often a scroll put up during the conflict emblazoned with flags and the Canadian coat of arms, recording those from the parish or area who served. The scroll could be a subtle recruiting measure, with the implied question to young men still at home, “Why isn’t your name there?” As the horrendous number of casualties grew during the First World War, there was an urgent need to fill the vacant ranks. Churches were quick to lend their authority to the effort to encourage volunteers, hosting church parades where the regimental band attracted the curious and the recruiting sergeant waited at the door. No rally would be complete without a clergy on the platform. A patriotic duty became a religious duty. But the scroll could also be an ominous reminder of the price of volunteering. As news filtered back from the front, a † would be added beside the names of those who died, and a • next to those who were wounded. The memorials were important for bereaved families. Their relative may have died an ocean away, and this was the only focus close to home for the one they loved. It might be particularly important for the families of the more than 11,000 Canadian soldiers whose remains were never identified, whose names are inscribed on the Vimy memorial but whose final resting place is unknown. The names on the memorials can be a bit of a puzzle. Who were these people? Why are they on the list? When townspeople erected their cenotaphs, and congregations planned their plaques or stained glass windows, they polled themselves—who should we commemorate? 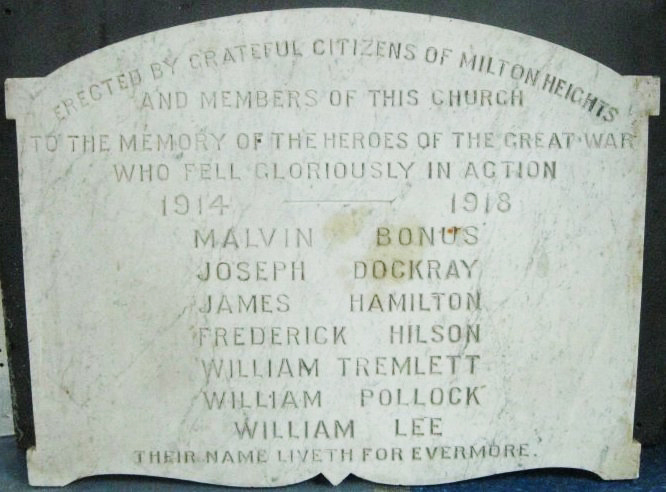 Two of the 17 names inscribed at the Methodist Church in Oakville (now St. John’s United Church) were brothers who may never have visited the town, but whose only relative in Canada was a member of that congregation. One memorial names a John MacDonald—there were over 50 Canadian John MacDonalds who were killed during the First World War, but none with an obvious connection to the town where he is remembered. Some high schools have made a history project, where each student is tasked with discovering whatever he or she can about one of the names on the school’s memorial. A parish might attempt a similar project. There are lots of resources. One of the best is the Canadian Virtual War Memorial, which has a page for each of the more than 118,000 Canadians who gave their lives while serving their country. When we learn more about those who have died, we identify with them. The crowds who gather along the Highway of Heroes, or who paid their respects to Corporal Nathan Cirillo, the Hamilton soldier who was killed at the National War Memorial in Ottawa, feel linked with those who serve on our behalf. With the passage of time, however, the links become more tenuous. To learn more about those who are commemorated is one way to reforge those links. The Reverend Richard E. Ruggle is a retired priest of Niagara Diocese, with an interest in church and military history.